Kia recalls 379,000 Souls to prevent fires related to catalytic converters and damaged pistons. 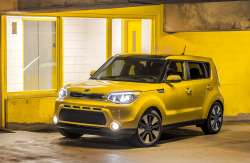 February 28, 2019 — A Kia Soul fire recall will attempt to repair 379,000 vehicles equipped with 1.6-liter gasoline direct injection (GDI) engines and catalytic converters that may overheat. The 2012-2016 Kia Soul recall follows a petition to investigate Kia fires in Sorentos, Optimas, Santa Fes and Hyundai Sonatas, but the petition didn't include the Soul. The Center for Auto Safety filed the petition to investigate non-collision fires after finding more than 200 complaints filed by Kia customers about smoke and burning odors. According to the Soul recall, high exhaust gas temperatures can cause damage to the catalytic converters from overheating, resulting in piston damage, abnormal engine combustion and connecting rod failures. The Kia Souls can stall from piston damage and the busted connecting rods can puncture the engine blocks and cause oil leaks. Leaked oil onto hot exhaust components can easily start fires. Kia submitted its defect petition response to the National Highway Traffic Safety Administration (NHTSA) by saying no defect trend had been found in the Soul. However, engineers analyzed data related to claims made about the engines and discovered a possible link between the fires and damaged catalytic converters. In addition, Kia determined a damaged converter can allow particles to enter the engine combustion chamber and cause abnormal engine combustion. Kia didn't say how many fire reports have been received, but there have allegedly been no crashes or injuries caused by stalled engines or fires. The Soul fire recall will require that dealers updgrade the catalytic overheating protection engine control unit software to prevent heat damage to the converters. Damaged catalytic converters will also be replaced and it's possible technicians will need to replace the entire engines. Kia didn't announce when the recall will begin, but owners of 2012-2016 Kia Souls may call the automaker at 800-333-4542 and refer to recall number SC176.